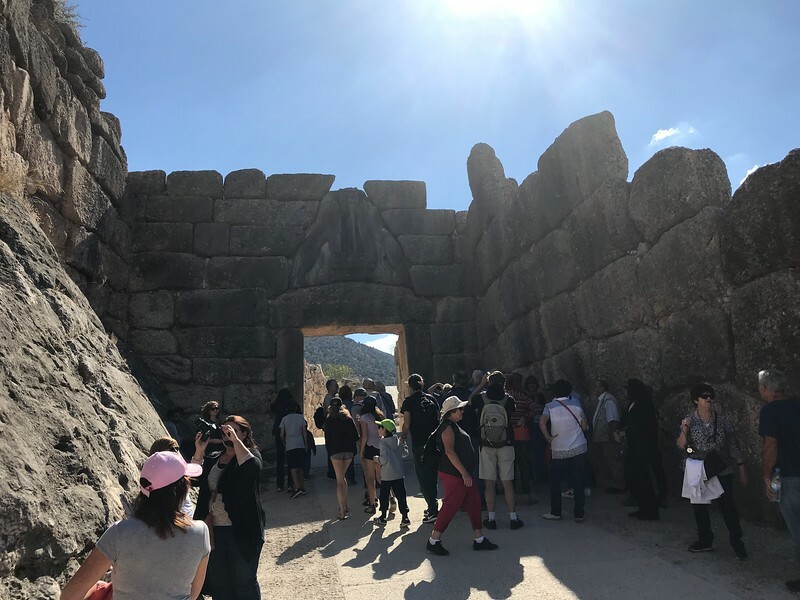 The Lion Gate, Mycenae, Greece, 2017.10.15. "The design of the gate had precedents in other surviving artworks of the time; a similar design was depicted on 15th-century Minoan seals and a gem found at Mycenae. Many other pieces of Mycenaean artwork share the same basic pattern of two opposed animals separated by a vertical divider, such as two lambs facing a column and two sphinxes facing a sacred tree representing a deity. The architectural design in the gate relief may reflect an entrance of a type characterized by a central support, commonly a single column. More specifically, the gate relief may allude to the propylon (structure which forms the entrance) that provides the main direct access to the palace. The lions acted as guardians to the entrance of the palace. If so, the symbol of a sanctified palace entrance would have appeared above the gate of the fortifications: a double blessing. Beyond the gate and inside the citadel was a covered court with a small chamber, which probably functioned as a guard post. On the right, adjacent to the wall, was a building that has been identified as a granary because of the pithoi found there containing carbonized wheat." back to Mycenae, Greece, 2017.10.15 index.